Klay Thompson was on fire Monday night against the Indiana Pacers. 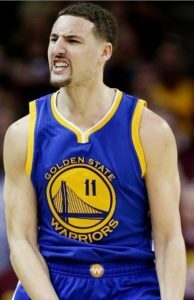 Klay scored 40 points in just the first half, then scored 20 more in the 3rd quarter. At 60 points in 3 quarters and only 29 minutes of play, who knew how many points he would have scored if he stayed in the game. Steph Curry went crazy on the sidelines cheering his teammate on. After the game he said, “That’s a feat that I’d put money on to probably never be touched ever again in the history of basketball. It’s unbelievable.” Warriors 142, Pacers 106. Oklahoma City Thunder’s Russell Westbrook continues to shine with his sixth straight triple-double in a win over the Atlanta Hawks Monday night. Wilt Chamberlain still holds the record for 9 straight triple-doubles back in 1967. Thunder 102, Hawks 99. Even a die-hard football fan probably turned off the Indianapolis Colts vs New York Jets on Monday Night Football. With QB Andrew Luck’s 4 touchdowns carrying his team to a devastating 41-10 win over the Jets, the Colts are now in a first place tie in the AFC South. The ceremony for the most prestigious award in college football, the Heisman trophy, will take place Saturday December 10th. The five finalists, announced Monday night, will travel to New York City to attend the ceremony. Louisville quarterback Lamar Jackson is considered the favorite, but Oklahoma QB Baker Mayfield and WR Dede Westbrook, Michigan linebacker Jabril Peppers, Clemson QB Deshaun Watson are all in the running.